Founded in July 2011 and headquartered in the heart of London, Innovations Infinite takes a revolutionary approach to enterprise software that redefines what your business can achieve. After more than a decade in the IT industry, Anish Kumar saw the same, tired approaches to business software everywhere he looked. The industry seemed to be stuck in first gear, selling slow, expensive and limited solutions. Anish founded Innovations Infinite to break through these roadblocks, delivering truly affordable software with a holistic business impact - fast. Professional services companies worldwide choose our software. From law firms and insurance companies to technology businesses and consultancies, we empower our customers to work more effectively and achieve the outstanding results their clients demand. Sales Infinite reduces cost and complexity by delivering one, unified platform that provides outstanding visibility and control over your entire business operation, far beyond just CRM. Our platform matches or exceeds even the multi-million dollar solutions used by the biggest enterprises - at a fraction of the cost. A simple cloud-based delivery model and ultra-fast implementation mean you will be up and running in no time. Where some solutions make you wait months or years, you can enjoy all the benefits of our platform in just a few weeks or even days. Sales Infinite lets you to stop worrying about IT and refocus on what your business is all about: clients, services and sales. Access from any operating system, browser or device is easy over our secure, encrypted connection. Better still, by keeping all your information in one platform your business will never drop a lead or lose valuable information in the cracks between departments. We believe the benefits of powerful enterprise software should be available to companies of all sizes, not just the largest corporations with the biggest budgets. We empower progressive, forward-thinking companies with far-reaching solutions that are both affordable and fast to implement. Software development is difficult and time-consuming, but we have come up with a solution. Think of it as the industrial revolution for the computer age: we can finish complex IT projects at lightning speed because our coding is done by robots. That's right. Robots. Once we outline the specifications of a project, the coding process is entirely automated - reducing project timescales by 80% or more. Robotic coding also eliminates human error, making our testing process even more streamlined. What does that mean for you? We can deliver more feature-rich software, five times faster and at a lower price. We're also far more responsive when it comes to further customisation, platform updates or support queries. The robot revolution has begun! Anish Kumar is the founder and managing director of Innovations Infinite. 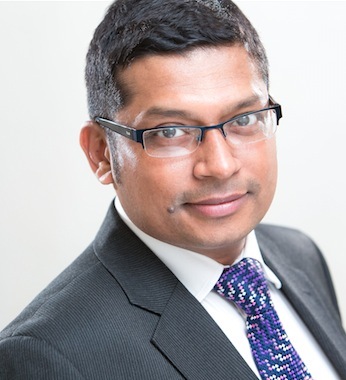 During his career, Anish has worked as an analyst and project manager for some the world's biggest insurance, business change and information technology companies, including Brit Insurance, Swiss Re, Infosys Technologies and Quadriga Worldwide. Anish has undertaken years of pioneering research into computer-aided software engineering and code generation. This culminated in the development of Accelerated Solutions, a ground-breaking tool that can bring products and solutions to market in far shorter timescales. Today, Accelerated Solutions underpins everything Innovations Infinite delivers. Anish holds a B.Eng in Computer Engineering from Pune University, India.